I can definitely relate to your "Financial Freedom" statement! I married a corn-soybean farmer in Central Illinois August 2013. I too am terrified of the farm account. Ava, thanks for your comment! I'm glad I'm not the only one! I can relate to all the above in one way or another I'm dating a fourth generation cattle, hay, small grain farmer we have been together for 7 years and have a three week old little boy. Some days I get so lonely because unlike most farmers he still goes to a full time job then comes home and farm. Before we had the little one I took care of the day to day operations whether it was vetting the cattle or selling hay or running for feed. Now with the little one and it being chilly out here in Pennsylvania I can not do the things I'm used to be doing I hope it gets easier. Even though we only live 30 mins from the stores I still hardly get there. 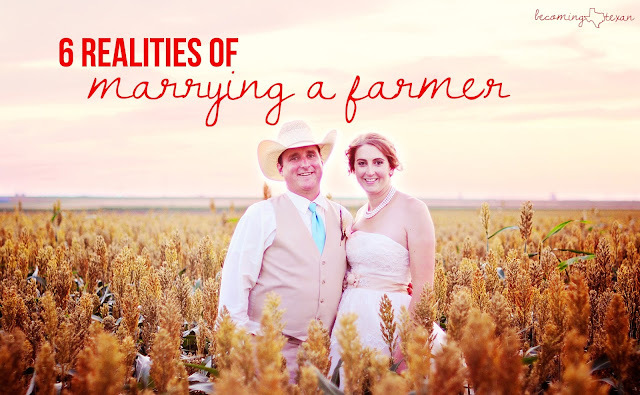 I like reading other farmer blogs because it makes me feel connected to people that know the daily life struggles and enjoyment that a farm brings. Crystal, thank you for sharing, and congratulations on your new little boy! What an exciting time for you both! That must be very challenging with your farmer working full-time off the farm. My husband and I are very blessed that the family farm was big enough to support him working there full-time. I know (from being raised on a farm) that it can be very challenging raising a child and still doing farm chores, but once your boy is a little older, I'm sure you'll figure out a way to take him along. I was outside with my mom doing chores every day from the time I was about 3 years old, and those times are now some of my favorite memories. Again, thank you very much for reading and sharing your story. You definitely are not alone in the farm life struggles! Just married a dairy farmer two weeks ago and coming from a farm family myself it all scares me, the finances, the family time, the work-life balance. I just hope I am as understanding as I hope to be. Congratulations on your marriage, Carilynn, and thanks for reading! It is scary and rightly so. As farm kids, we know how hard it can be, but we also know how rewarding it is. It is much different writing your name on the checks instead of watching your parents do it though. :) You'll be fine, but feel free to reach out to me any time you are struggling! We can struggle through it together.